This arrival at Lake Garda is one you will never forget. Almost like on an airplane, we will float 2000 meters downhill from the wild peaks of the Paganella. Next to us, the rugged white peaks of the Brenta Dolomites comprise a beautiful, almost unreal scenery. Mountain biking can't be any more spectacular than this. However, that is only the last highlight of a dream route that everyone should have ridden once. Start at Landeck makes keeps the daily stages from becoming too long or too difficult. That way, we won't have to leave out any beautiful trails. We will quickly leave Landeck behind us and bike into the upper Inn Valley. The Via Claudia Augusta and hidden trails lead us to Pfunds. Via an old fortress, we'll climb up to Nauders and a 4-star wellness hotel. Vinschgau trail highlights are on the agenda today. But first we climb the main ridge of the Alps. The natural paths to Plamort are in a class of their own, the view of the Ortler and Lake Reschen legendary. Then we continue to Vinschgau with narrow paths and built trails. Of course we drive "Holy Hansen" and other things. The knighthood for every Trailfan. A cable car will assist us to aschbach high above Merano. We'll take a capital pasta break with a panoramic view. Fast descent to Lana, then we'll continue at a comfortable pace to our hotel. It features a panoramic pool and is situated in the middle of the Nals vineyards. From the wine village of Girlan, an ascent over the art trail leads on to the emerald Montiggler Lakes. 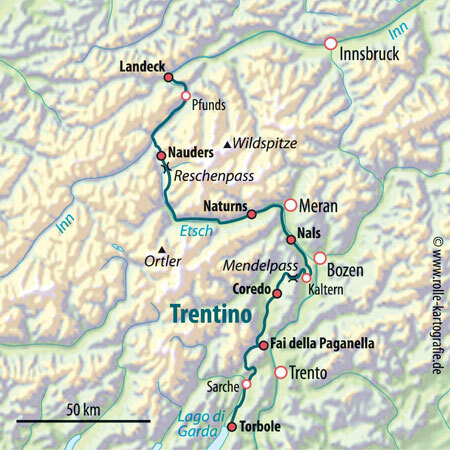 Over trails and narrow paths, we'll ride through vineyards to Kaltern and then up to the Mendel Pass. Then a sensational descent over wonderful trails to the monastery S. Romedio and its brown bears. A nice hotel awaits us in Coredo. On lonely cart tracks, we’ll ride steeply uphill. We'll be rewarded with a glorious view down into the wild Brenta Dolomites. With its vineyards and apple orchards, the Valle di Non has all sorts of treats requiring technical riding in store for us. In the evening, we'll relax in the hotel overlooking the Paganella mountain. We can still amp it up one more notch. The summits of the Paganella and the Monte Gazza want to be conquered today. We will be rewarded with an awe-inspiring descent down to Lake Garda. Farewell dinner. After breakfast, the bikes are loaded onto the bus. Return trip by bus back to Landeck. Upon arrival, everyone travels home individually. Marcel Tschannerl, ALPS bike guide for the Transalp Trentino. Arrival: Arrival by car or by train to Landeck/Austria. Type of route: Gravel paths, paved secondary roads, trails. July: 13. /	20. /	27. August: 03. /	10. ** /	17. /	24. /	31.